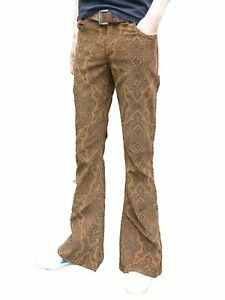 Tan Brown Paisley Corduroy. We make this style in: stonewash (light blue) denim, indigo (dark blue) denim, dark brown cords, light brown cords, navy blue cords, light blue cords, black cords, grey cords, burgundy cords, beige cords, khaki cords. There are 326 items available. Please enter a number less than or equal to 326. VAT price: 17.5% (included in the listed price). We accept most payment methods and dont charge extra for using paypal. Please email if you are unsure of the postage costs.